This blog post was written by Lisa Visser. 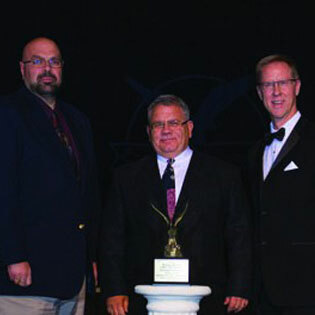 Associated Builders and Contractors (ABC) of Iowa announced that Interstates Companies’ work on the Ozark Mountain Poultry Feed Mill in Batesville, AR, has earned the company an Award of Distinction in the Electrical – Commercial & Industrial Over $2 Million category of ABC of Iowa’s Excellence in Construction Awards. Interstates Companies representatives received the award October 12, during the annual Excellence in Construction Awards celebration at the Prairie Meadows Events & Conference Center in Altoona, IA. The Excellence in Construction awards program is designed to honor innovative and high-quality merit shop construction projects. The award honors all construction team members, including the contractor, owner, architect and engineer. The winning projects, selected from entries submitted from across the state, were judged on complexity, attractiveness, unique challenges overcome, completion time, workmanship, innovation, safety and cost. “This project is an example of the innovation and commitment to outstanding craftsmanship that embody merit shop construction. The superior workmanship illustrates the high level of quality produced by merit shop contractors,” said ABC of Iowa President and CEO Greg Spenner. Earning the Award of Distinction at the state level qualifies the entry for the national ABC Excellence in Construction competition. Learn more here.